Parents invest countless hours (and a significant amount of money) on activities for their kids. Many family evenings and weekends are spent at softball practice, dance lessons, cheerleader tryouts, soccer tournaments and the like. With a long list of places to be on any given day, kids, like their parents have busy schedules. Families on the go need a vehicle that will keep them safe, comfortable and can be trusted to get them where they need to be. If you are shopping for a more family friendly vehicle there are a few points to consider. Since softball uniforms, tutus, pom poms and soccer cleats are expensive, most families need to find a vehicle that is as affordable as it is practical. Buying a used family vehicle can save you thousands of dollars. Vehicles that are only a few years from their original production date are often priced well below new models on the lot. Many pre-owned family vehicles are available with extended factory warranties and/or warranties offered by the dealership. Used car dealerships like Honda of Atlanta are happy to help you find a vehicle covered by warranty, offered at a good price. All parents put safety first so your next vehicle must be well equipped with safety features. Vehicles that have driver assisted technology such as lane departure warning, forward collision prevention and rear view cameras will help you stay safe and collision free on the road. You can also review NHTSA and IIHS crash safety ratings for any new or used vehicle. These ratings can be valuable tools for deciding between two similar vehicles. Auto manufactures have learned that the majority of commuters need space for passengers and their stuff. The wide variety of SUVs and crossover vehicles is good news for families. With lots of choices between full-size, mid-size and compact sports utility vehicles, it is easy to find a vehicle that will fit your needs. Some families prefer the benefits of minivans to SUVs as they usually offer extra rows of seating and family friendly features such as video screens and entertainment options to keep kids busy during long drives. 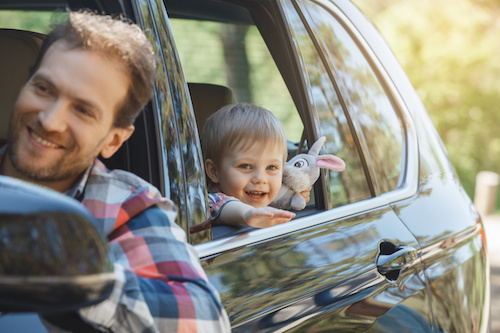 It’s a good idea to make a list of all the things you normally transport along with your family so you can shop for a vehicle that has ample room for a stroller, camping gear, ice chests and your dog. Our Used Car Dealership near Atlanta has a wide selection of family friendly vehicles to choose from. We invite you to explore our used car inventory to see photos, prices, vehicle details and more. Bring your family in for a test drive and we will help you find a used car, SUV or minivan that fits your busy lifestyle and your budget.